Once again, Michaelangelo has eaten all the pizza in the Turtle’s Lair. Splinter decides to hypnotize Michaelangelo and suggest to his unconscious mind that he no longer craves pizza. Meanwhile, Shredder attempts to create a holographic image of Michaelangelo, in an attempt to infiltrate the Turtles’ Lair. But, thanks to Rocksteady and Bebop’s incompetence, the disk with Michaelangelo’s psychological profile is put in backwards, causing the holographic producing machine to malfunction and zap Shredder instead of the holographic image of Michaelangelo. 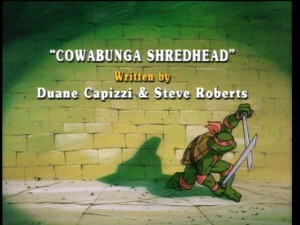 And, you guessed it – Shredder now thinks that he is Michaelangelo. Back at the Turtle’s Lair, Michaelangelo seems to have passed the “acid test” when he refuses to eat pizza, when suddenly, Shredder enters the lair carrying four pizza boxes and acting/talking just like Michaelangelo. It does not take Splinter long to figure out what is going on and he instructs the Turtles not to mention Shredder’s name until they discover what his plan is. But the real Michaelangelo is not too happy about this situation and leaves the lair in a huff. Meanwhile, Donatello discovers a computer disk that fell out of Shredder’s pocket and decides to take it to Channel 6 News to use April’s computer system to access the information on the diskette. Once there, they surmise that Shredder plans to clone Michaelangelo, and Shredder, who thinks he is Michaelangelo, is none too happy about that. Raphael asks Shedder/Michaelangelo where he might go if he wanted to sulk — the answer: Vinny’s Pizza. But Leonardo, Raphael, and Shredder/Michaelangelo arrive just moments after the real Michaelangelo is abducted by Rocksteady and Bebop. While they search the kitchen, Shredder/Michaelangelo stuffs his face with pizza and sees some cheese clinging to a cheese shredder. When he says the word “shredder” aloud, he is transformed back into his former self: the evil villain, Shredder. He is confused, but not so confused that he does not realize that he is alone with the Turtles. The Turtles, not suspecting that he has reverted, are also caught by surprise and are left stuffed inside a pizza and heading straight for the oven. At the Channel Six News Building, the Turtles realize that they must find the holographic synthesizer and destroy it, along with finding the real Michaelangelo. Dontello has a plan that might accomplish both. They head back to Vinny’s Pizza and recreate the scene just as Shredder/Michaelangelo had encountered Leonardo and Raphael moments before they were “saved” by Shredder. After calling him by name, he reverts back to Shredder and demands the computer disk. They give it to him and “beat feet” before he has a chance to capture them. They then follow him back to his hideout, where he discovers that his disk has been reprogrammed and he is surrounded by dozens of holographic Michaelangelos. Shredder ejects the disk and all of the holographic Turtles disappear only to be replaced by the real Turtles. In their attempt to destroy the Holographic Synthesizer, Shredder has them encased in a force field – but they outsmart him when they call him Michaelangelo and he reverts back to a “Turtle” and destroys his own machine when he sees his “amigos” in trouble. Before the machine blows, Shredder is zapped by the machine once again, and is, once again, reverted back to Shredder but, by now, Rocksteady and Bebop believe that he really is a Turtle in disguise and they take him back to Krang and the Technodrome.